Onward State's Kevin Horne is on a field trip to the (non-university-affiliated*) Student Book Store in State College, tweeting pics as he goes. Maybe you'd like a framed photo of the Joe Paterno statue? 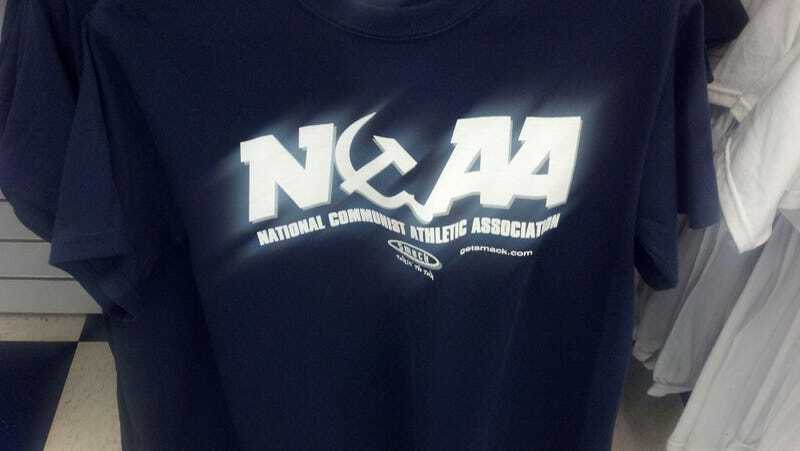 It'd go great with this t-shirt, rebranding the NCAA the "National Communist Athletic Association." "Overstepping Their Bounds And Punishing The Innocent Since 1906"
Warning: This shirt is not licensed or endorsed by any institution or organization. Its sole purpose is to enable the individual wearing it to express the message contained on it. Obviously the shirt isn't university-approved, and college stores in every town have sales racks lined with trashy stuff like this. But why would anyone ever buy this? If you wear this shirt outside of State College, you're never going to hear the end of it, and could possibly be physically assaulted. So why bother preaching to the choir in t-shirt form? Also, you have no idea what Communism is, do you? UPDATE: There seems to be some confusion, but we want to emphasize that this is a completely independent store, not affiliated with the university in any way. I've tweaked some language to make that clearer. The story is not that Penn State itself is selling these shirts; it's that they even exist, which is bad enough.